Step Van... anyone build one? Has anyone built a step van? I am in the process of building one for a junkyard diorama, from plans/measurements that I got from one of the real 1:1 manufacturers, I am curious where to get the "commercial truck wheels" in 1/25 scale. Anyone know where to get em? i have wanted to build a Grumman step van for a really long time, but i dont have the scratchbuilding skills for that yet. i did buy a long time ago Monograms F350 dually kit for the chassis and it's correct style wheels, but had planned on using a small-block Chevy for power. my dad drove these trucks for over 20 years and i spent alot of my childhood riding around in them. most of it seems pretty easy, but i'm at a loss as to how to replicate the hundreds of rivets on the outside of the body. that's it Mike, but how might we get one of those? Thanks mike, that's certainly easier than scratchbuilding one. Dave... my idea for the rivets was to make a mold of the ones from the Ford Lousville truck kit, on the box, and then recast them and attach them to the side in the appropriate locations. Not sure if this is the best approach, but it was my plan. 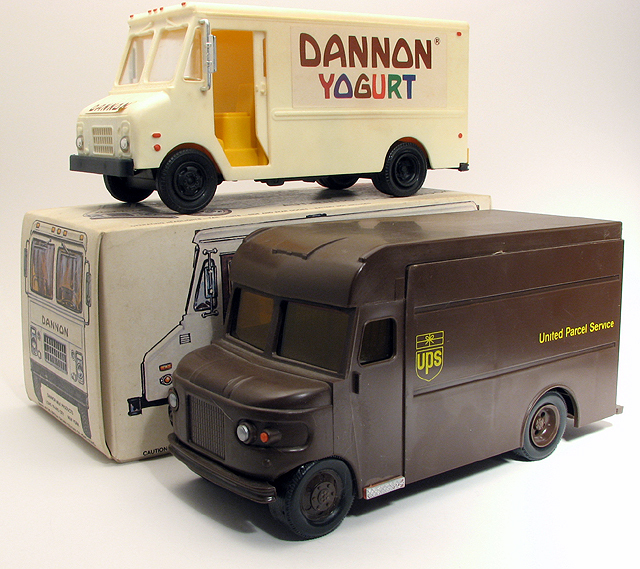 Aha, the ever-elusive Dannon Yogurt 1/25 scale step van model/toy has been converted to resin! I have one of the Dannon trucks, got it years ago. A good modeler can do a lot to improve on it, but at least the step vans are a fairly simple design. Maybe they show up on Ebay from time to time. I'm not giving mine up. Nor my 1/25 scale UPS package car, another elusive 1/25 scale model that's pretty cool. Zoom Zoom, aka Bob Downie My Fotki Album The only cure for modeler's ADD is "final assembly and decal placement"
i want to add ALL of the detail's that i remember. the floor pan in the front section bolted together, so it could be disassembled for drivetrain maintenance. the transmission cover in the truck my father had that was stick shift would blow up a few inches when driving on the highway, the bolts were stripped in the aluminum. i was always amazed to see the road speeding under the truck when it did that! i have tons of memories, i spent alot of time as a kid with him on his routes. keep us posted on your progress Chris! QUOTE: ZOOM ZOOM:Nor my 1/25 scale UPS package car, another elusive 1/25 scale model that's pretty cool. Uh, I haven't seen that one...post a pic? PLEASE! How 'bout both of 'em? I've only seen 1 or 2 other UPS truck models like this ever. Lee Baker in Chattanooga bought one and detailed it up a bit, looks very nice. I have the box for this one and will probably leave it as-is. Surprised no resin caster has dug one up to recast, I think it would be fairly popular if they did so. i do remember someone resin casting that UPS truck and quickly getting in trouble. apparently UPS has some sort of copyright on the truck body and from what i understood, shut him down in a hurry. my son has a UPS truck toy in what looks like 1/32 scale that my wife found at a yard sale, i wonder how many of those are around? Very cool trucks! I remember seeing a 1/32 Divco truck, and I got a 1/72 Chevy Stepside (Air Force flight line truck) but never seen one in 1/24. Sure would be cool to find one! 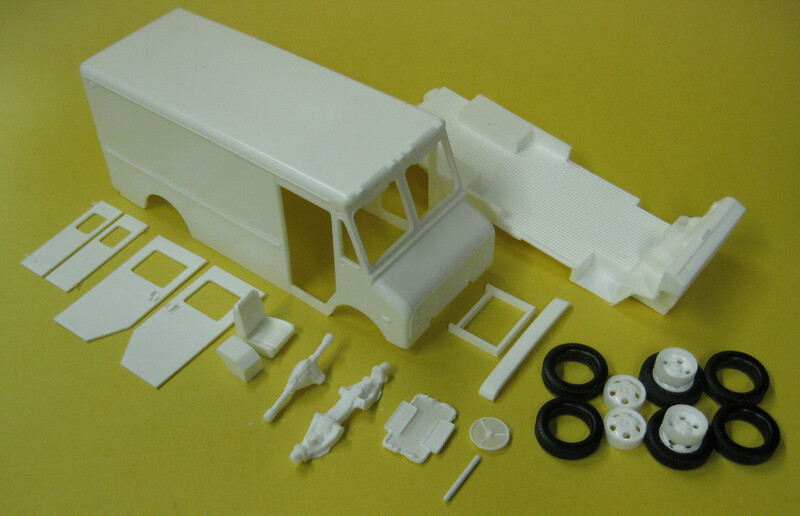 There was a Tamiya Toyota Hi-Ace truck a long time ago that could be used in your build up. From: "Valley of the Sun"
HA Mike... I got a UPS van. I think it's 1/24 or 1/25. I don't know the differance, it's die cast. e-mail if your interested. I've bought from him a few times. I've had problems with him being out of stock on items I wanted, but he won't take orders on stuff he doesn't have in stock until he gets them in. The quality and service is good, I have been happy with all my dealings with him. I really have been working to scale one of these out to scratch build. I would buy a UPS truck in a heartbeat. Any way you might share your plans? I still want to scatchbuild one! I wanted to post a pic of my detailed 1/25th UPS truck, but posting a pic here looks to be a bit difficult. Oh well. Jeff Ballard at Motor City Resins has released a new casting of the Uptown Automotive Step Van and it is a beauty. I got one to do my son-in-laws food truck.